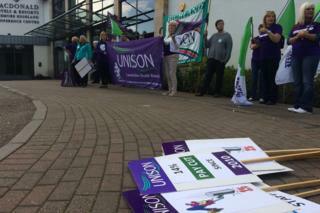 Healthcare workers in the Highlands have held a protest against a 1% cap on public sector employees' pay. The union Unison said workers on lower pay at NHS Highland are having to use food banks because of the cap. The protest was held as NHS Highland chiefs gathered in Aviemore for the health board's annual review meeting. As she arrived for the meeting, public health minister, Aileen Campbell, told the protesters the government was listening to their concerns. The minister added: "We all value the NHS and we all want it to function the best we can." About 50 NHS Highland employees took part in the protest. Ahead of Thursday's meeting, Unison's Highland healthcare branch secretary Jeanette McQuiston said workers felt they were being "badly treated". She said: "People on lower wages are finding it extremely hard. "They are having to go to foodbanks for help. "We are coming into the winter now and, with rising electricity and gas prices, people are going to have to make a choice of whether to eat or heat. "In 2017 that is not acceptable." NHS Highland said the pay cap was a matter for the Scottish government to make a comment on. Finance Secretary Derek Mackay said the Scottish government has committed to ending the 1% pay cap in future years. He said: "We have always sought to offer a distinctive pay policy, being the first government to pay the real living wage and ensuring higher increases for those on lower salaries. "As we work towards the next Scottish budget we are engaging with trade unions across the public sector on a future pay policy that reflects rising living costs as well as the need for sustainable public finances. "This includes working with NHS trades unions to assess the effect of pay restraint on NHS staff. The outcomes of that process will inform the evidence submitted by all parties to the pay review body."